Sardinia is a great part of the world and it has a lot to offer to any traveler. Many people come hear to spend some relaxing time and find great places to see. What awaits you here? 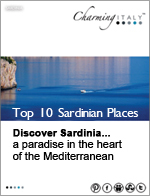 Find out from a very compact and interesting free e-book by CharmingItaly.com on Top 10 Sardinian Places. The clear waters, the many islands available, some included even in UNESCO World Heritage, caves and great weather, all draw people year after year. But who knows all the islands? Who knows all the places worth a visit in Sardinia? CharmingItaly.com offers a free e-book on Top 10 Sardinian Places. It is available here and the only request it to sign up to their newsletter – which is also very interesting. From the e-book you’ll find out about great caves, places reachable by boat, great islands to choose from when planning your vacation here. It is a simple, with accent on images, with compact and relevant information e-book. Oh, yes, and after you’ll finish it you’ll want to search the internet for a good offer to go visit at least one of those places!